Even with their status as a breakfast food, I’m of the opinion that there is rarely a bad time for beignets. 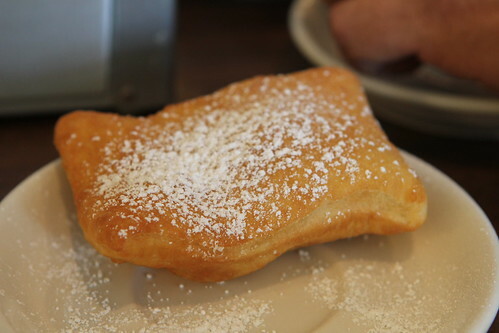 Be it morning, noon, or night, you’d be hard pressed to find someone that would turn down a yeasty beignet that’s fresh from the fryer and drenched in powdered sugar. It was this sort of reasoning that had Sam and I making our first stop at Morning Call in Metairie at a few minutes past noon. Regarding Morning Call, while I had heard people mention an alternative to the beignets from Café du Monde, I didn’t learn the name of this Metairie haunt until Serious Eats published their 36 Hours in New Orleans:Budget Edition guide. Interestingly, Serious Eats went as far as to include Morning Call in their New Orleans day trip but not even mention Café du Monde. Curious to see if Morning Call’s offerings were truly superior to the standard bearers from the French Quarter landmark, I had little trouble convincing Sam that we needed to start this day trip to New Orleans with a little fried dough. Much like Café du Monde, Morning Call serves their beignets in orders of three. What surprised me was that the powered sugar is left up to the diner. Each table was equipped with a shaker and soon we were enveloped in a white cloud of confectioner’s sugar. Sans sugar, these beignets had a well rounded and yeasty flavor that was good but a little flat. The plain beignets might have been better if they were fresh from the fryer instead of plucked from the holding tray, but a liberal application of powdered sugar made these thick squares worth the sugary mess. 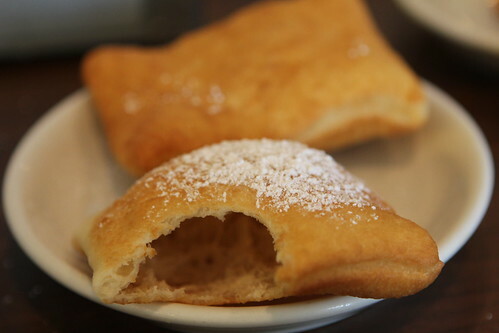 Of course what would a beignet be without a cup of chicory café au lait? 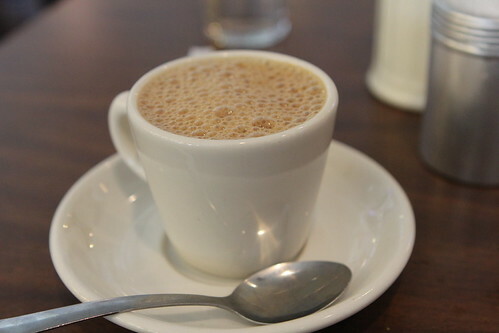 Rich and packed with that slight chocolate flavor of chicory, this cup of coffee was a superb match for the beignets. I’m still not completely sold on the idea of self service powered sugar. I’ll readily admit that it’s nigh on impossible to eat a properly coated beignet without getting caked in the white stuff, but I prefer the challenge to come from eating the pastry not from me adding the finishing touch. Even so, Morning Call does present itself as a suitable alternative to the crowds and impossible parking of Café du Monde, but I’ll have to try their beignets fresh from the fryer before I’ll think to call them better than those from the French Quarter. The Morning Call used to be in the French Quarter, I think in the space where N Peters splits off from Decatur about 3-4 blocks from Esplande. That closed circa late 70s sometime after this one opened. The old New Orleans Underground Gourmet always asserted that the original Morning Call was the best of the two places when they were both in the Quarter, and I think I've seen it said similarly since. Having only been in the Morning Call once, I express no opinion other than I'd rather be in New Orleans than in Metairie. 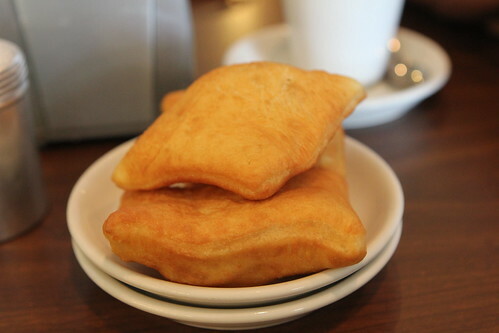 Don't give up on the Morning Call - the beignets are generally lighter and less greasy than Cafe Du Monde. The problem with letting them put the powdered sugar on is that you absolutely can't control the amount they use. We've gone through the Cafe Du Monde drive up on Veterans and have been totally disappointed with the beignets we received - flat, caked with powdered sugar, and not at all appetizing. Then we visited Morning Callmon Severn and treated to puffy ethereal clouds of pastry. Former natives displaced by Katrina, when we visit New Orleans our two must have treats are those beignets and the Orchid Cream Vanilla snowballs from the stand on West Esplanade, sometimes both on the as,e day!